Thin Mints can be eaten faster than any other cookie. Thin Mints must be eaten a row at a time. Once a row is opened, it will be consumed within ten minutes. Do not fight this. Once a box is open, it will be eaten within a day. No one buys just one box. Unless they are buying one box from five different people. Buying cookies from cute, smiling uniformed girls makes you believe the cookies are for a good cause and that this time you will not consume them all in one day. They are only sold yearly so that you forget how quickly you eat them, leading you to buy more because you can freeze them and eat them slowly, which you have never done in the 10 years you’ve been buying them. I also believe no one truly remembers the boxes they order and you could deliver the wrong boxes as long as you include some Thin Mints and Samoas. I did not test this theory completely, however. 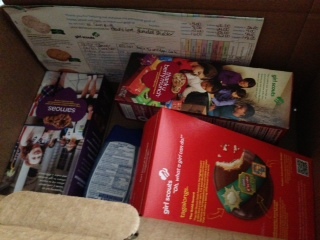 I did substitute a box of Samoas for a box of Tagalongs due to the fact that we kept our cookies in the garage and when we went to deliver them, one box of Tagalongs had mysteriously been opened with a row eaten, but not by any of my children, of course. Obviously someone broke into our garage, ate 4 cookies, then left. I think the only thing that would make Girl Scout Cookies better would be if you could fly when you ate them. I had 72 boxes in my house at one point. I have the control of a warrior. *I’ve eaten at least 3 boxes a year since the age of 10. There is something so inherently wicked with these Girl Scout Cookies. You can’t stop eating them! They’re worst than Crack, or Meth, or watching the Bravo cable channel. So damn addictive. There’s an evil genius (or cartel) behind them all, I say ;-). I love this so much! It’s also Girl Guide season up north here too. However, sadly, we only have one kind. Well, the vanilla and chocolate in the spring and the mint chocolate in the fall. I’ve always been a bit jealous of your variety…..